While helicopters are considered one of the more versatile flying machines, they also face many risks. Because of this, it’s recommended that all owners of helicopters or pilots invest in helicopter insurance. If you are wondering about helicopter insurance and what it can do for you, this article is going to take a look at some of the frequently asked questions regarding helicopter insurance. Why do I need helicopter insurance? Because of the high risk that comes with flying a helicopter, insurance can help protect you in the event of an accident. However, your particular insurance coverage will depend on the use of the helicopter. What exactly does helicopter insurance cover? Hull insurance: This covers property damage when the helicopter is on the ground or when it is in flight. This may protect your helicopter from risks like theft, vandalism, weather damage, or total loss due to an accident. Liability coverage: Your legal responsibility will be covered in the event that you cause personal injury or property damage while flying or landing. Passenger liability: If you carry passengers in your helicopter, this is necessary to cover public liability claims or passenger liability claims. Because of the high risk of owning and flying a helicopter, your aircraft insurance policy should have adequate liability coverage. Is there a difference between private and business helicopter insurance? 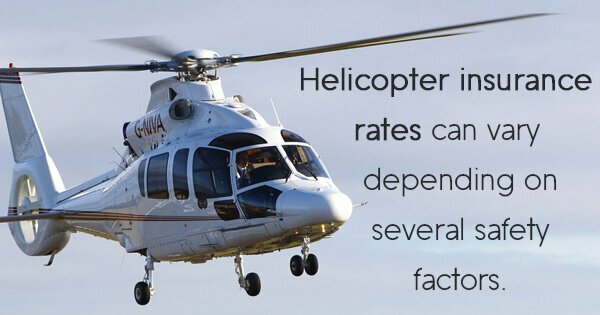 What determines my helicopter insurance rates? Aircraft insurance rates for helicopters can get expensive due to the high risk associated with helicopters. However, your specific helicopter insurance rates will be determined by the type of coverage you buy, the value of your helicopter, and your intended use of your helicopter. Additionally, your helicopter insurance rates may vary depending on your piloting experience and your safety record. Even though over 3.5 billion people flew safely on 37.6 million flights in 2015, according to the International Air Transportation, you can never be too safe. Because of the risks associated with flying a helicopter, the specifics of your insurance policy may vary. It’s important to work with an experienced agent who will be able to assess your needs and create a policy that is tailored to your specific situation.